Your Valentine’s Day shopping and planning for your wife might be well under way—and that’s good! Some may view this as just another excuse for greeting card and flower companies to make money—as well as jewelry, candy and clothing companies, etc.—but it’s also true that some husbands need that reminder to be romantic and thoughtful and treat their wives special. Ideally, we should have that attitude every day of the year. What about our daughters? Many dads do use Valentine’s Day to express love for their daughters as well. And should you we something for our sons too? Is it appropriate for you to remember them on Valentine’s Day? Absolutely! It’s not only appropriate; it could make for a meaningful tradition. True, it might seem odd or uncomfortable. Boys might even say, “Dad, that’s weird.” But it isn’t—and deep down, you know they’re eating it up. What kinds of thoughtful things would a dad do for his daughter for Valentine’s Day? Give her candy? A small piece of jewelry? How about a daddy-daughter date? Maybe a card that expresses his love and affirms her great value? It will look different with sons, but it’s still worth trying. Pick up a small gift related to his favorite sport or hobby. What growing boy would turn down a bag of edible treats? Or, set a time to do something together—just the two of you. And don’t leave him out on the affirmation. Let him know how much he means to you. Recognize him for his character. Tell him how proud you are to be his dad. Too many dads fail to affirm their sons because it’s seems too uncomfortable. They might rarely show physical affection or speak words of blessing. Well maybe Valentine’s Day can be a good excuse to start some new habits. The benefits are profound. There’s the simple but powerful force of positive words to give him confidence and belonging. There’s the example you’re setting of what it means to be a man who can express love in healthy ways. And, there are important identity issues that are influenced by a loving father. So, be thoughtful this Valentine’s Day. Go out of your way to communicate your love to your wife, your daughter, and yes, even your son. Don’t leave anyone out. 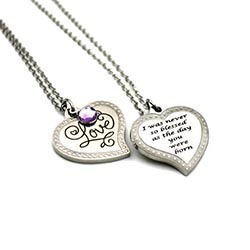 At giftsfromdad.org we have small jewelry pieces that are great ways to affirm your son and/or daughter. Your purchase also helps to support our work at fathers.com. Thank you.